Second Act: Jesse Hines | EasternSurf.com | All East Coast. All The Time. It’s been a good run. Actually, it’s been pretty epic. We’re talking “covers of all the major magazines” epic. And don’t forget the big-time video parts. The contest success. Charging the world’s best waves. Carrying the torch for the Outer Banks. Becoming one of the sport’s most beloved nice-guys. But in the world of professional surfing, nothing lasts forever. Jesse Hines, now in his mid 30s, knew that from the start. Which is why he’s reinventing himself: becoming more than just a pro. Now he’s an industry insider. A business owner. A father. He’s taken a step back. But don’t count him out. Because guess what? The dude still rips. Some things do last forever. “When I was a pro surfer, I would have been really nervous having a kid,” Jesse admitted. 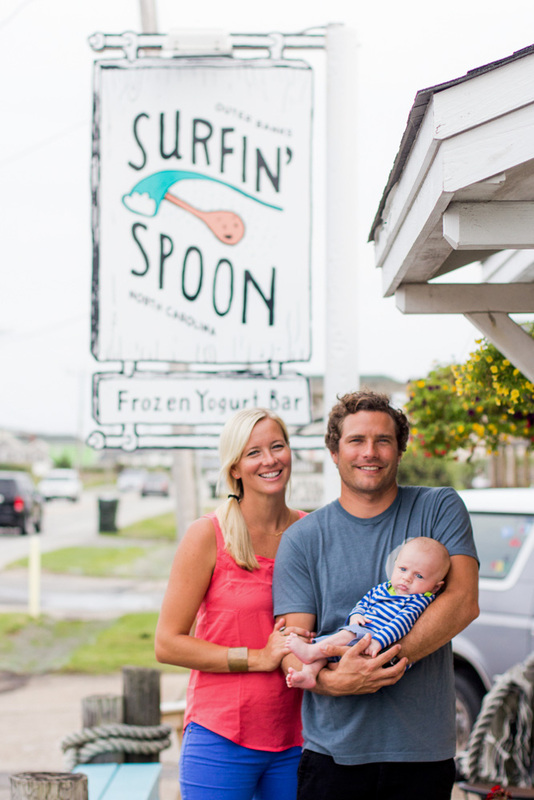 “I would have been scared about how to provide for my family, knowing that my career would be so short.” Which is exactly why Jesse and his wife started their own business a year ago: the beautifully decorated and immensely popular Surfin’ Spoon frozen yogurt bar in Nags Head, NC. Surfing is more about enjoyment for me now. I get to just surf for fun. I don’t necessarily have to paddle out wherever the photographer is or pull into closeouts. There’s less pressure — surfing isn’t my main source of income. My career is definitely in a different stage now, and I knew it was eventually going to lead into something else. But for me, it happened pretty suddenly. I was riding for O’Neill, and they put me on the guillotine in 2010. I thought there would be more time for me to come up with a plan before it happened, but, with the way the economy has been, teamriders are the first ones to go. It’s like getting the rug taken out from under you, and I was really angry at first because I knew I had been doing a good job for them. But it was just a matter of them not having enough money in their budget. I was a pro surfer for 11 years and was with O’Neill for seven of them, so I had to sit back and think, “Well, they took care of me for this long.” But it’s still a tough place to find yourself in, especially because I was married and had a mortgage. Then, all of a sudden, I had no more money coming in. My advice to anyone surfing professionally these days is to just be prepared. Going into it, you have to realize that you have five or, if you’re really smart, about 10 years in pro surfing. As soon as you start getting paid, you should be planning your exit strategy, whether it’s thinking about school or something else you want to do, or working in the industry. It’s a very short window, so enjoy it while you have it, but also know that it will end sooner rather than later. Luckily, I had always been working construction on the side throughout my whole surf career. So I just did more of that, and then I fell into a job with one of my other sponsors. I’ve been with SUPERbrand Surfboards for about three years now, and I was riding for them when a position came open for sales, marketing, and helping out with their East Coast team. Jumping from pro surfing straight into sales actually wasn’t too much of a transition because, since I never had an agent, I was always selling myself to the sponsors. But it definitely takes a person with a business mind. I also started thinking that maybe I should do something for myself. 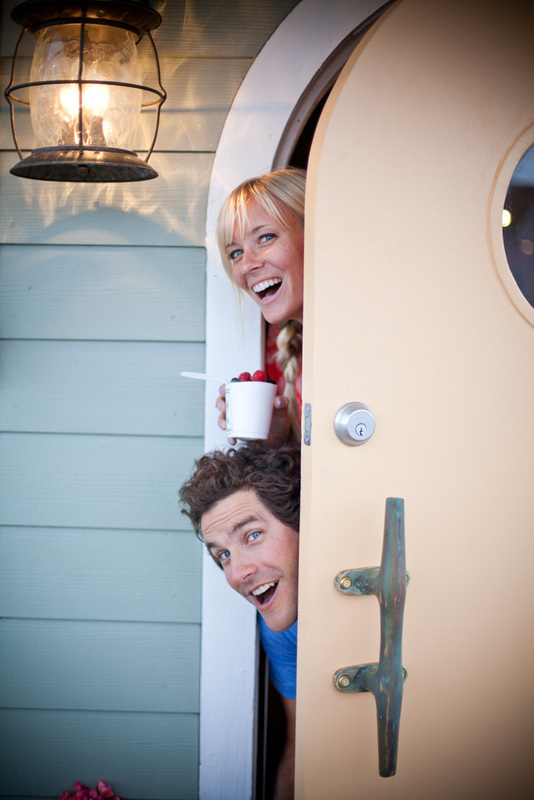 So that’s when my wife Whitney and I decided to start the Surfin’ Spoon, our little frozen yogurt bar that opened last year. 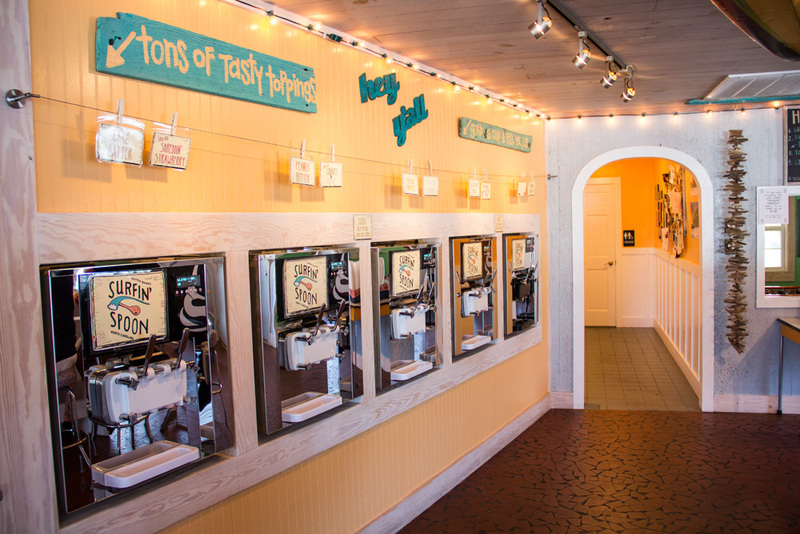 A few years ago, we were in Georgia visiting friends, and we saw a self-serve frozen yogurt shop. 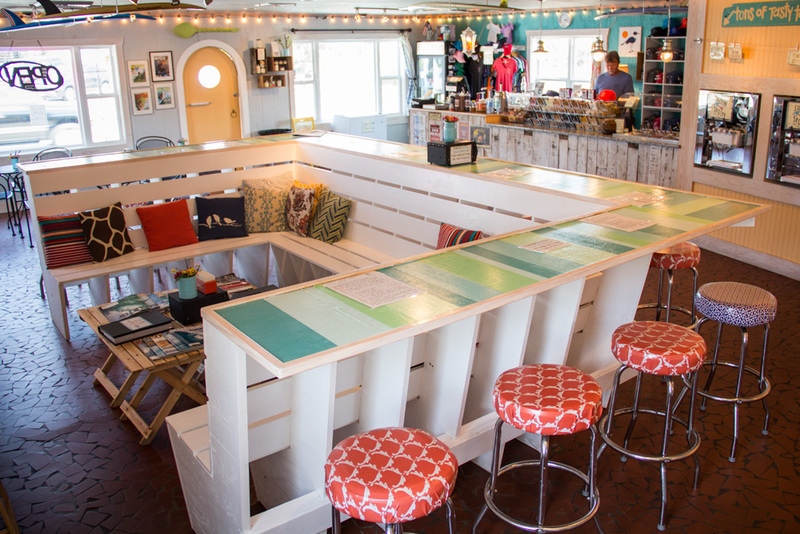 We knew it would be such a great idea for the Outer Banks. There wasn’t one here at the time, and the whole idea is family-oriented and fun, so we knew we could bring surfing into it. But it took us a couple of years to plan, and a chain opened here in the meantime. There was a line out the door every single night. My wife and I were really bummed, but we were also thinking, “Man, if they’re doing this good, we should still try to do it.” So we moved forward with it. We had always talked about opening our own business. We wanted to do something that could involve surfing without being directly correlated with the industry. My parents own a surf shop, and a lot of my friends do surf lessons, so I wanted to do something that wouldn’t compete with what they were doing. So that’s how this evolved. 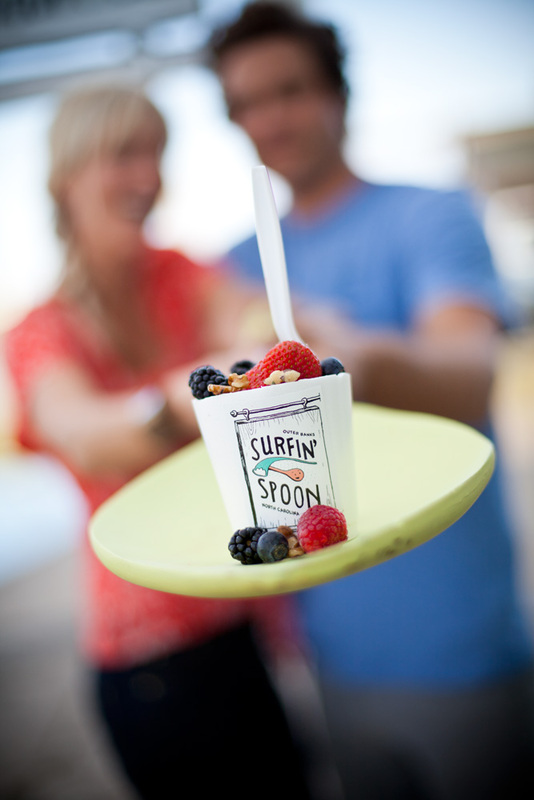 We worked our butts off to make the Surfin’ Spoon happen. Whitney painted and decorated the whole thing, and I built some of it. I know just enough about construction to get myself into trouble, but my friends who are way better at it came and bailed me out when things got too difficult. And Whitney’s brother is an architect, so he designed the floor plan for us. We knew we wanted this place to have character. 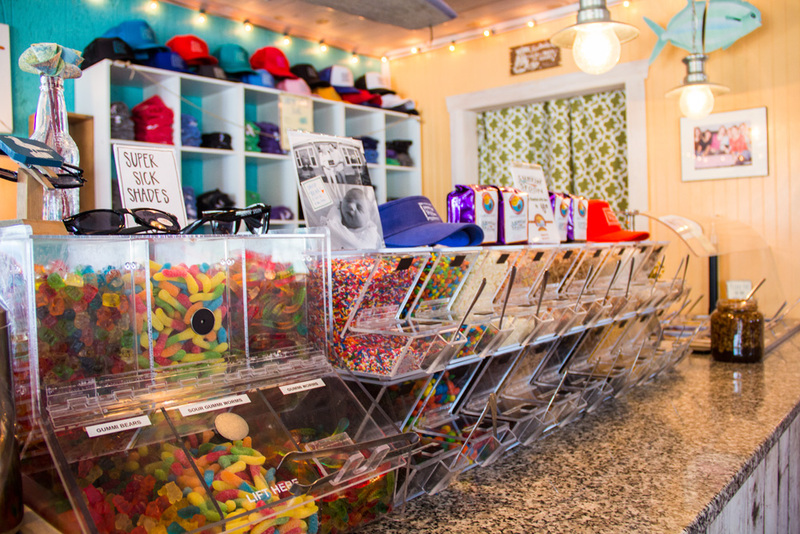 Most frozen yogurt shops are like a hospital waiting room plus loud pop music. They’re all kind of sterile-looking. We wanted ours to feel classic and nostalgic. The building itself has actually been there since the ‘60s, so we wanted to incorporate all that history and character. We also wanted to involve our lifestyle here on the Outer Banks, so we loaded the place up with historic photos of this area, a bunch of cool old boards, and the two ESM covers I was on, along with the ones from Surfer,Surfing, Transworld, and Waves. It gives us a one-up on the competition, because it’s unique, and tourists love it. We wanted to create an environment that felt like home. We wanted local kids to have a place to hang out and parents to know that their children were safe when they came to the Surfin’ Spoon. We haven’t even been open more than a year, but these kids have already created memories here, and it’s been really cool to see that happen. We’ve had so much support from the community and all our friends, too. I think that’s really where we’ve gotten most of our business: locals sending the tourists in. All of this has been like seeing a dream come to fruition. Something that was just a thought became an actual building, and now we have a logo and T-shirts and a line forming in the summer. It almost doesn’t even feel like it’s our own. It feels like it was always meant to be, and we’re just the hands that got to make it happen. When I was a pro surfer, I would have been really nervous having a kid. I would have been scared about how to provide for my family, knowing that my career would be so short. So it’s nice to know that we have this business with some traction. And it’s been so cool to have our son, Bear, around. Whitney and I have been married for 12 years, so we were together a long time without any kids, and it was really fun. We got to do so many things together during that time, so I’m glad we waited. But it’s also been so cool to see what it’s like to be a parent. I don’t surf as much these days, but I actually don’t even care. There were little waves this morning, but I was hanging out with Bear, and he was just smiling at me and laughing, so I didn’t really mind that I was missing waves. It’s been amazing having a kid and being able to enjoy that. I can’t wait for him to surf and be in the water.